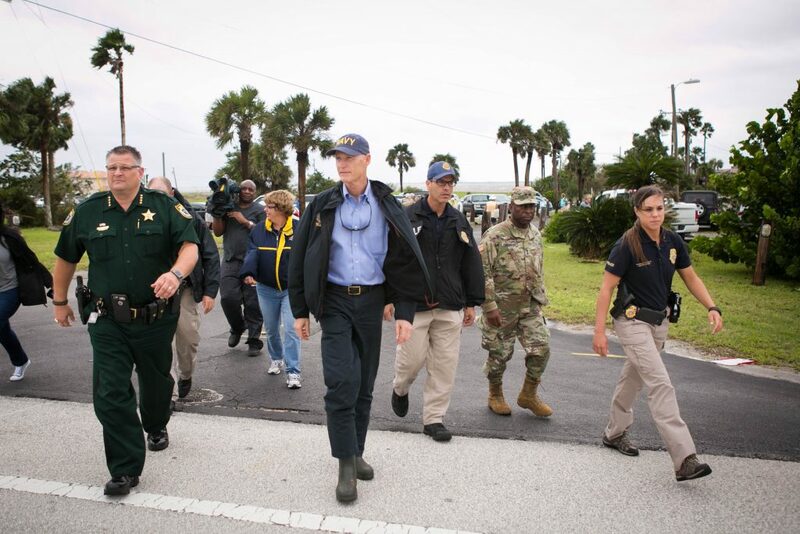 Florida Governor Rick Scott is accompanied by local and state law enforcement and national guard troops as he tours Cocoa, one of the towns impacted by Hurricane Matthew’s tango with Florida’s east coast. Florida Governor Rick Scott toured storm-ravaged cities and counties in Florida this afternoon as the damage assessments following Hurricane Matthew’s visit to the state began in earnest. The governor met by telephone with mayors of dozens of cities this morning and again this afternoon, also paying personal visits to coastal communities, including the town of Cocoa, which is at the eastern terminus of the Beachline Expressway. Meanwhile, three service plazas on the Florida’s Turnpike reopened in South Florida earlier in the day Friday, after conditions borne of the monster hurricane had largely passed from the region. Engineering assessments determined none of the buildings had suffered any structural damage that could be potentially harmful or life-threatening. All services plazas from West Palm Beach and south were open Friday night. Service plazas north of West Palm Beach remain closed, including two in the metro Orlando area, the Canoe Creek and Turkey Lake plazas. As for Hurricane Matthew, itself, the storm has been downgraded to a powerful category 2 system, which is sending strong storm surges and high winds across the very northeastern edge of Florida and across coastal Georgia. The storm is expected to turn east into the Atlantic over the weekend, then turn south once more to head toward the Bahamas for a second time.